Tired of Searching All the Carpet Stores in Scottsdale, AZ? When you're updating your living space, it can often be difficult to find the exact products you're looking for. You end up going to multiple locations trying to find the option that meets your needs, looks great, and lasts for years. At Flooring America of Scottsdale, that's exactly what you'll find. Instead of visiting all of the carpet stores in Scottsdale, AZ, turn to us. With our expansive selection and dedication to helping you find the perfect flooring materials for your bathroom, living room, or any other part of your home. When it comes to comfort, nothing can beat carpeting. With its plush texture and innate insulating capabilities, carpet flooring provides a soft area to walk on and helps reduce echoes and noises in your living space. Does it ever feel like it's impossible to navigate through every aspect of the flooring purchase and installation process? With many carpet stores, you're left to peruse the samples on your own without knowing the benefits different styles or brands have to offer. Our showroom is different. When you talk to our sales staff, you get all the information you need to feel confident about your purchase decision. From comparing carpet prices to helping you decide what type of fibers will work for your house's high-traffic areas, we're here to answer all your questions. We offer a range of recognizable and trusted brand names for you to choose from, such as Karastan, Mohawk, and Shaw--and we're happy to help you decide which brand best meets your needs. 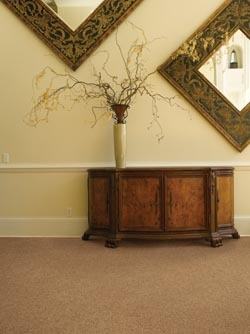 In addition to providing the advice you need at the time of purchase, we also offer carpet installation services. Our contractors have years of expertise and a commitment to your satisfaction, so we know your new carpets will be installed without any issues--in fact, we guarantee it. There are many advantages to choosing carpet floors. From its soft texture to providing extra protection against slips and falls, there's no other material quite like it. While many homeowners love our selection, we also want to extend these unique advantages to business owners as well. We carry an assortment of commercial carpet that has the potential to transform your workspace. With different colors and textures available, you're bound to find an option that matches your building's decor. Visit our showroom to get started. Contact us today to learn more about our carpet flooring products. We proudly serve the communities of Scottsdale, Arizona, including McCormick Ranch, Gainey Ranch, Pinnacle Peak, and Grayhawk.